I think my family let me have the bubbliest piece because they love me. I ran across this recipe while browsing King Arthur Flour's blog Flourish a couple of weeks ago. The post was written by one of the KAF owner employees I met when I was there for a baking class--Julia Reed was assigned to take some pics in the Baking Education Center and she was such a warm person with a great sense of humor. 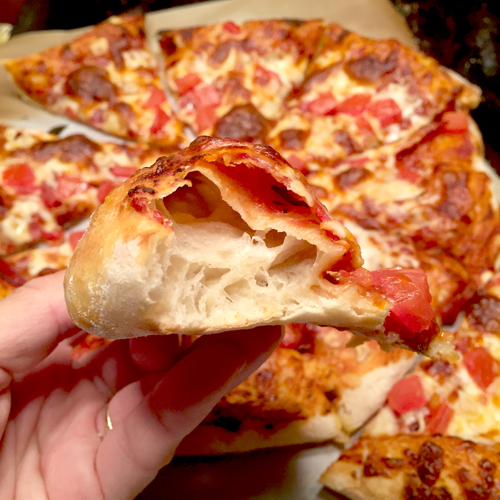 At any rate, she titled this post "The Best Pizza You'll Ever Make" and it's true. 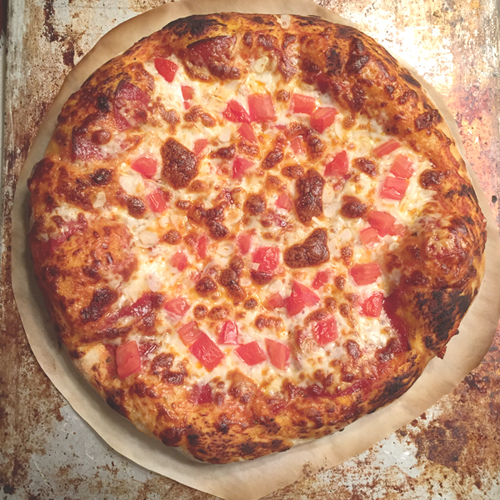 I've made a LOT of pizzas in my day, and I really think this one was the best--and simplest. The crust got delightfully bubbly, crisp, and chewy, and it had a fabulous flavor all on its own. Then with the toppings...mmm. Just perfect. And the dough prep involved no kneading at all--just a little stirring, folding, and waiting. If you want to see a great tutorial with detailed pics of the process, click here. Below is how I did it, but know that I referred back to the Flourish post several times just to be sure I was on the right track. 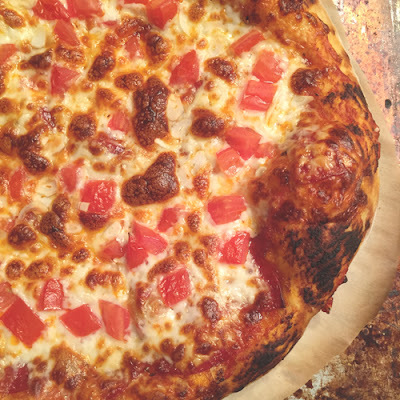 So, if you're into pizza and want to experience an airy, bubbly homemade crust, you have to try this recipe. You just have to. Note: I made a 1 1/2 recipe since I knew my family would require an amount of pizza produced by at least 3 cups of flour as opposed to the 2 cups in the original recipe. What you see below reflects what I actually did. Note: This pizza turns out best if you have a baking stone, or even better, a sheet of baking steel (which I do not yet have). Mix all of the ingredients in a large bowl. Dough might look a little dry now, but it will turn gooey and wet over while it ferments/rises. 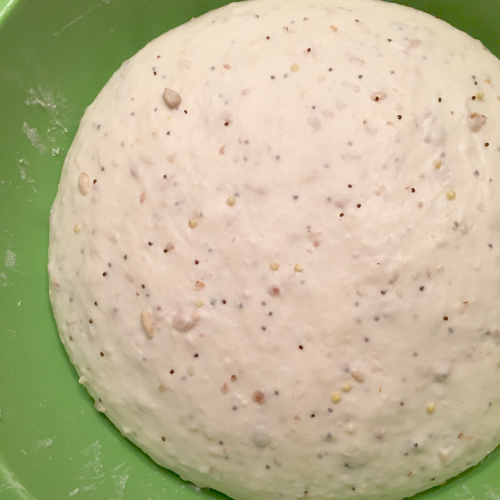 Cover bowl and allow dough to rise 24 hours. When dough has risen and you're about 1 1/2 hours from wanting to eat pizza, preheat oven to 550 degrees Fahrenheit. Turn dough out onto a heavily floured surface and cut in half. Working with one piece of dough at a time, stretch one end of the dough and fold over the middle third of the piece of dough. Then stretch the other end and fold over like a letter. Go to an unfolded side, stretch, and fold just like you did before, but with the opposite sides. Tuck all of the ends to the underside and place in a floured bowl. Cover. Repeat with the other piece of dough and allow to rise for 45-60 minutes. Get all of your toppings ready. Line a pizza peel or underside of a baking sheet that will act as a peel. Turn a piece of dough out onto a well-floured surface. With gentle fingertips, press and stretch dough from the center taking care not to squash the outer 1/2 to 1 inch of the circle you are forming. Then gently lift dough circle with your knuckles and allow dough to stretch with the force of gravity, gently moving your knuckles around the edge to stretch and enlarge the crust. Stretch to about a 12 inch diameter and then place on the prepared parchment. 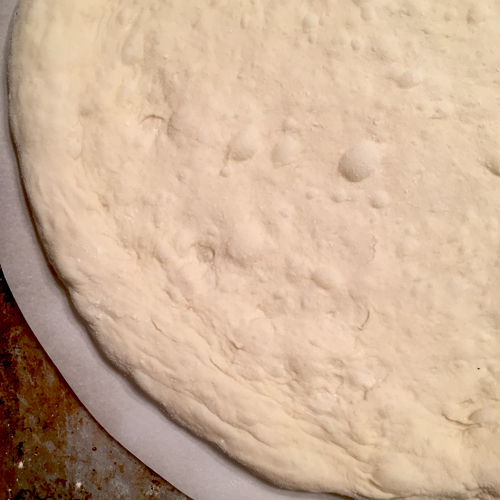 Cut the parchment in a circle about 1/2 to 1 inch larger than the crust. I topped my pizzas with homemade pizza sauce, pepperoni, sliced mozzarella, Roma tomatoes, and fresh sliced garlic. 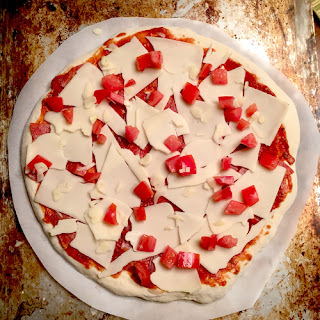 Pizza will start to char on the top of the big, bubbly edges and cheese will be melted and probably start to brown. Slide back onto pizza peel or inverted baking sheet, cut, and serve. Be careful not to burn you mouth. Right after mixing the dough, it's lumpy and kind of dry. 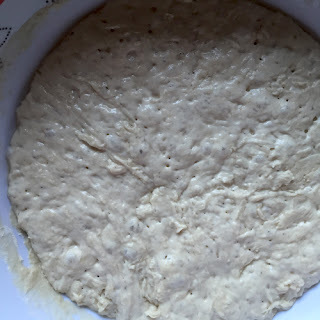 Surprising how wet the dough gets after 24 hours. 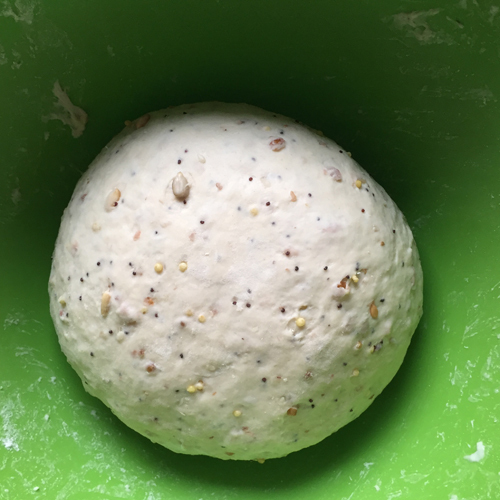 These dough balls are sitting for their second rise. See the original post on Flourish for more pics. I've really been liking the sliced mozzarella that I've been using lately on pizza. Can you hear the angels singing? Oh my goodness. So good. Looks like somebody has already eaten one of the rolls. 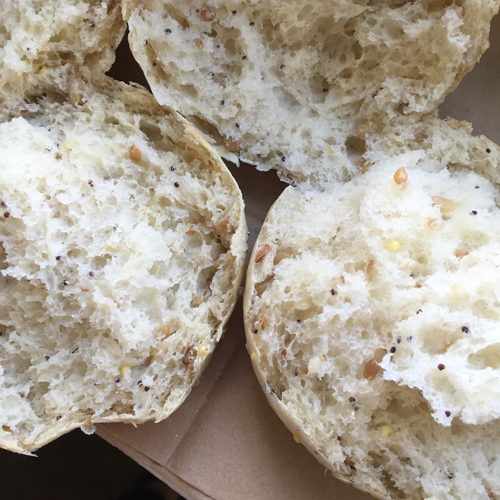 Although I'd never label myself as fan of multi-grain anything, I can't get enough of these rolls. I may actually like these as much as I like the French batards that I learned to make at the King Arthur Flour Baking Education Center. When I made these in the Bread: Principles and Practice class, I forgot to add the yeast and salt. I know, kind of dumb considering there's only a handful of ingredients in these rolls. My excuse is that we were using weight measures for the first time that day, and I got all flustered when I forgot to press "tare" on my scale...at any rate, I didn't realize my mistake until after the first rise when my dough didn't smell yeasty at all and just had an odd texture. 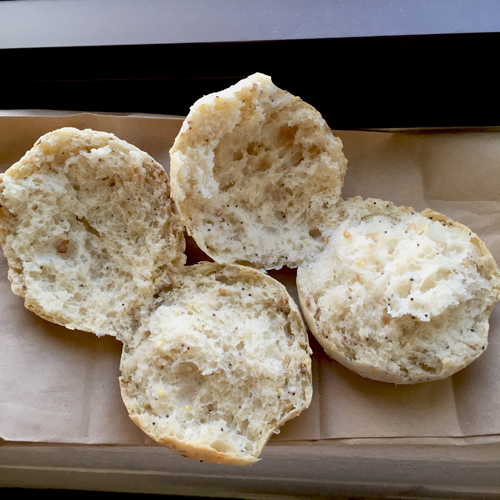 My "rolls" ended up like little beige hockey pucks, so they all got tossed into the compost bucket. Sigh. 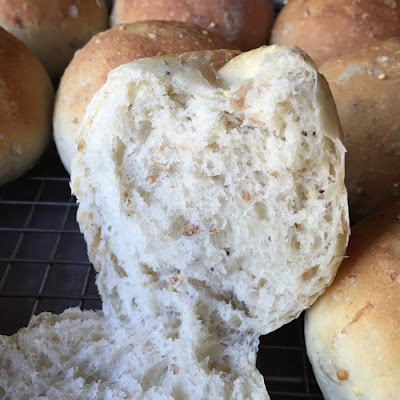 I did get to try the rolls that my teacher and my baking buddy Diane made, though, and that made me even sadder about my mistake, because I loved them. I enjoy all of the textures in this roll, as well as the flavor and salt level. They are chewy, but light, and each of the grains and seeds provide their own flavors and textures that make each bite different. I like them fresh and warm with a bit of butter, but they are also fabulous with a little mayo and deli roast beef. Mmm. Believe it or not, it took me three tries (well, four if we count the one in my baking class) to get these right. At first I just used all purpose flour because it's what I had and I'd forgotten we used bread flour in class (and that the recipe called for it--duh). So my first two batches at home just did not have the fabulous fluffy, open crumb texture that instructor Amber's had. Then I remembered the bread flour. Not four hours passed between that realization and my trip to Target to pick up the bread flour. And yes, the bread flour makes a BIG difference. 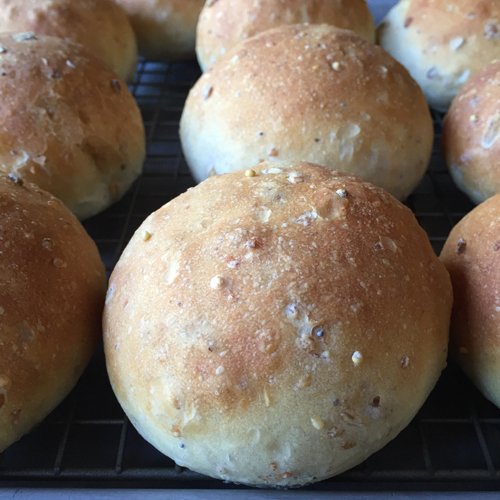 The bread flour rolls are softer and fluffier, with bigger air pockets on the inside and a chewier, more pliable exterior. Even though I switched to a half-recipe for the last two tries, I still have many of these in my freezer. I need to curb this bread baking frenzy I'm on. Maybe this week I'll take a break. Maybe. 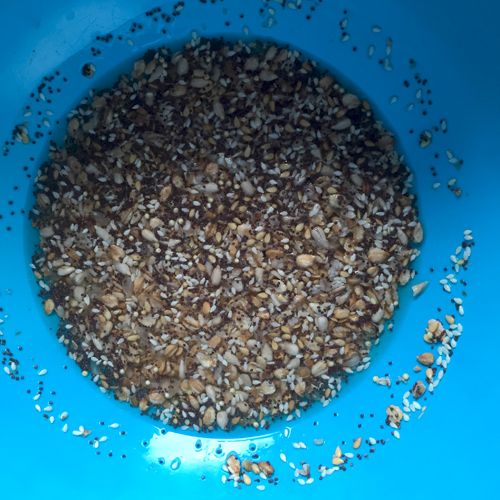 About 8-16 hours before you plan to mix up the rolls, place grain mix in a large bowl and cover with water. Cover bowl with plastic wrap and allow to sit for 8-16 hours. 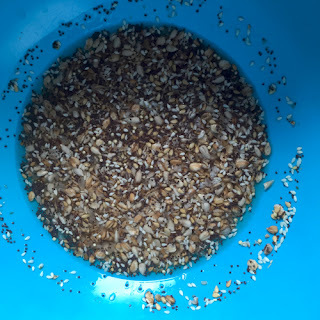 After grains have soaked, add the remaining ingredients. 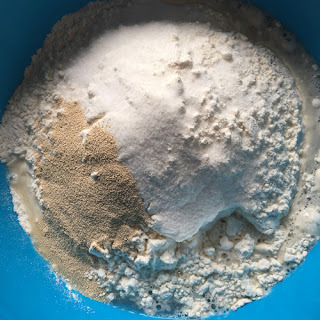 With a bowl scraper or a spoon, mix 5 1/2 cups of the flour and the rest of the ingredients until the dough comes together and flour is completely incorporated. Using the remaining half cup of flour a little at a time to lightly dust a kneading surface, gently knead the dough until elastic and springy, dusting only with as much flour as necessary to keep dough from sticking to surface. Remember not to knead too aggressively. Return dough to the mixing bowl and cover with plastic wrap. Allow to rise at room temperature for 45 to 90 minutes, or until doubled in bulk. 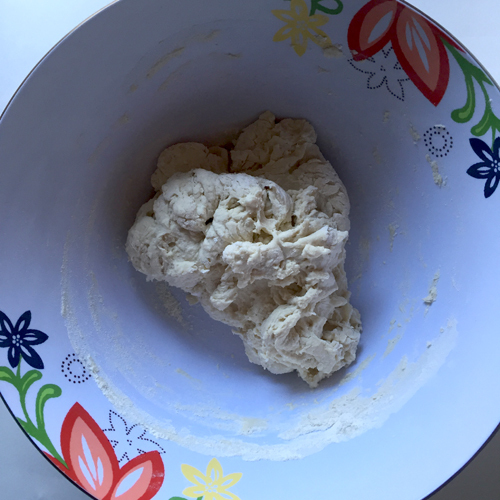 Turn risen dough out onto a lightly floured surface and cut in half. Pull the edges of each half together to form two pouches. Flatten slightly and cut each half into 8 equal portions. 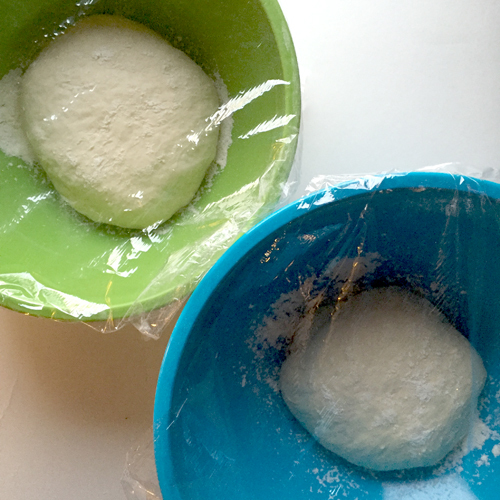 Take each piece of dough and pre-form it into a pouch. Then roll each pouch into a ball and place on prepared baking sheet. Cover dough balls with plastic wrap that has been sprayed with non-stick cooking spray. Allow rolls to rise for 45 to 60 minutes, until well puffed. Bake at 400 degrees for 17-20 minutes, or until nicely golden brown in color. 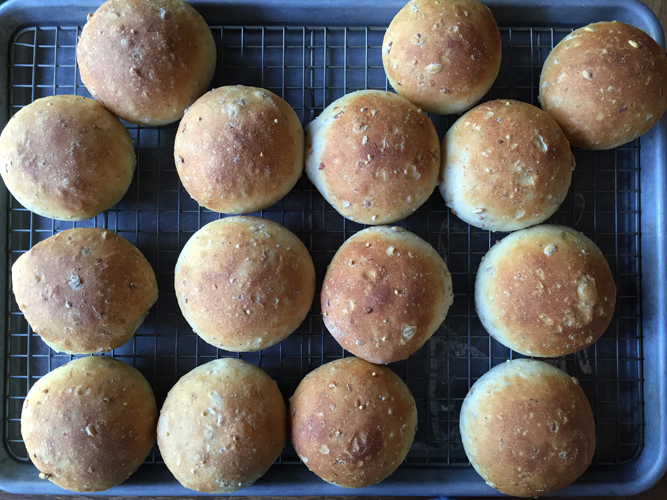 Remove rolls to a cooling rack and allow to cool for a few minutes before enjoying. Freeze any uneaten rolls in a zip-top freezer bag. Note: In class we made one small boule and 8 rolls. I like the rolls, so that's the recipe I'm giving you. You can also divide dough in half and form two loaves. Slash before baking and bake 28-32 minutes at 400 degrees F.
I remembered all of the ingredients this time. Can you see the difference in texture between these two rolls? Roll on left has all purpose flour, and the roll on the right has the bread flour. Long story short, I had to take a pic of these rolls on the windowsill of the classroom I subbed in today. Mix and store in an airtight plastic container or bag.